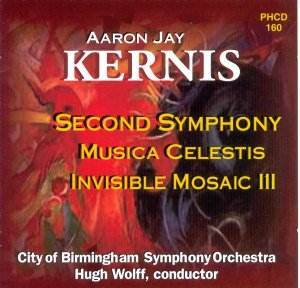 Kernis's Second Symphony seethes and bellows, seemingly driven by the Furies. Thomas May's extremely helpful booklet notes relate this work to the Corigliano First Symphony. The language will be familiar if you know the 1960s symphonies of Schuman and Bernstein. Be warned though, across the movements (Alarm; Air/Ground; Barricade) only the second lets go of the cherished and constantly refuelled anger. That second movement broods and consoles and is most beautifully and naturally paced. It has about it something of Barber's Adagio in its tender DNA. It is a most moving discovery and one I urge you to share. High violins sing in slow bleak paeans in Barricade only to be joined by emphatically discordant protesting brass and percussion. It rises at 5:23 to a rhetorical plateau of sustained protest and sorrow slightly redolent of Shostakovich at his most harrowingly intense. It is topped off by a gong-sustained tsunami of sound. It is a relief after such vehement and splenetic music to encounter Kernis's most famous piece. This is the middle movement of his First String Quartet transcribed by the composer for full string orchestra. I imply no sameness but certainly anyone who already enjoys Pärt's Cantus or Barber's Adagio (also the central movement of a string quartet) needs to seek this out. This writing is gentle, yielding, supplicatory and emphatic yet never hectoring. The swelling forte blows at 5:15 are extremely moving inducing a real frisson. Lastly there is the catastrophic and chasmal fury of Invisible Mosaic III. Pumping iterative Stravinskian writing links with seismic upheavals from the percussion and a manichean whiplash that recalls Ligeti, Henze (Wreck of the Medusa) and Mennin (Piano Concerto). The grandeur, deeply-packed colour and orchestrational brilliance is memorable. There is a raucous finale of heroic uproar - a strange fusion of Bruckner (Eighth Symphony) and Copland (Third Symphony). A fine collection . In fact the place to start your Kernis collection.